Ning Lu, left, and Jie Lu will return to Brandon University to open a new season of the Pro Series. BRANDON, Man. — A renowned husband-and-wife piano duo will return to Brandon University (BU) on Tuesday, Sept. 20 to kick off the 18th season of the School of Music’s Pro Series. 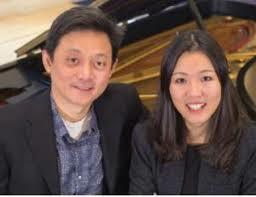 The Lu Piano Duo—Jie Lu and Ning Lu—are faculty artists and teachers at the University of Utah. They will give a recital of solo and duo piano works, including Piano Sonata in B flat major, D 960 and Fantasy for one piano four hands in f minor, D 940 by Franz Schubert, as well as The Dolly Suite by Gabriel Fauré. This performance is the pianists’ second Pro Series appearance; their first was in the spring of 2015. “We are thrilled to be returning to Brandon,” said Ning Lu in a recent message. Both pianists are originally from China. After studies at the Conservatory of Music in Wuhan, Jie Lu obtained an artist diploma with top honours and appeared as a soloist with the Wuhan Orchestra. A multi-award winner of both scholarships and piano competitions, she continued her studies in the United States, completing a Doctor of Musical Arts (DMA) at the University of Illinois. Along with her teaching duties, she is a recitalist who shares her knowledge as an adjudicator and gives masterclasses around the globe. Ning Lu’s first professional appearance took place when he was nine years old. His music education was first undertaken in Beijing’s Conservatory of Music, followed by studies in the United States, where he earned a DMA from the University of Boulder. Also a much-lauded competition winner, Ning has performed as a soloist with orchestras in both China and the United States, and as a recitalist. Audiences in Europe, Israel and Japan have also had the chance to hear him perform. Ning has three solo recordings to his credit. The recital starts at 8 p.m., at the Lorne Watson Recital Hall, in the Queen Elizabeth II Music Building at BU. Tickets will be available at the door prior to the performance or in advance at the School of Music main office. They are $15 for adults, $12 for seniors, students and BU alumni. Subscriptions are also available: $75 for adults, $40 for seniors, students and BU alumni, and $30 for Conservatory students. The next Pro Series presentation will feature the Toronto-based Nick Fraser Quartet featuring New York City’s Tony Malaby on saxophones. That concert will take place Tuesday, Oct. 4 at 8 p.m., also in the Lorne Watson Recital Hall. Please note that seating in the Lorne Watson Recital Hall is limited and that programmes are subject to change. For up-to-date listing of Pro Series and student performances, please visit brandonu.ca/music/events/category/performances/.